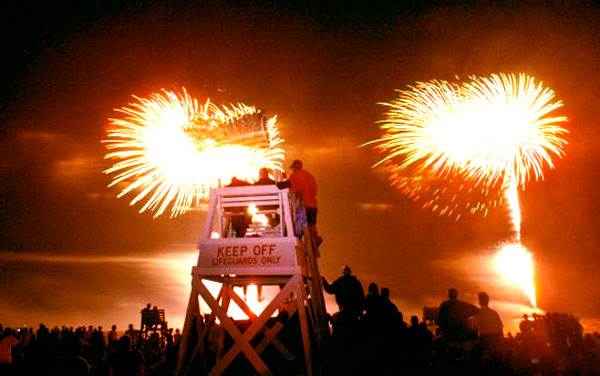 Ever wonder how many fireworks are launched during the Fourth of July Fireworks show at Jones Beach or how much garbage is collected after the holiday weekend? Here we give you a behind-the-scenes look into what goes into a fireworks show at Jones Beach, from Garden State Fireworks. (Credit: Garden State Fireworks / Chris Santore)Mortar racks consist of black pipe-like structures constructed from High Density Polyethylene tubing. Each firework is loaded into its own mortar, and then an electric match is inserted into each rocket, with each wired to a circuit. The expectation is that more than 7,000 hot dogs will be sold during the Fourth of July weekend. (Credit: Garden State Fireworks / Chris Santore)Garden State Fireworks Inc, founded in 1890, will be putting together the 2016 Jones Beach Fireworks Show. The company is custom-manufacturing display shells for the production, with about 25 people working on the display. The 2016 Jones Beach Fireworks Show is scheduled to run for 30 minutes, but the set-up takes four days. (Credit: Garden State Fireworks / Chris Santore)The aluminum foil in this photo is in place to prevent premature firing, and the plastic coverings are there to protect loaded and wired fireworks from weather. The plastic is removed for demonstrations . . . unless it rains. The muzzle velocity of a firework at launch point could blast through plywood without much difficulty, so should the rain start to fall, fireworks can still be launched through the plastic without issue. (Credit: Garden State Fireworks / Chris Santore)The fireworks pictured here are grand indeed, but those in attendance should keep an eye out for the spelling of "U.S.A.," one letter at a time in quick succession. (Credit: Ian J. Stark)Traffic fluctuates from year to year, but it is best to wait until traffic slows prior to leaving. With 100,000 people leaving at one time, roadways will back up -- so expect delays. Normally it takes traffic more than an hour to clear from the park. (Credit: Ian J. Stark)It should be no surprise that big crowds usually result in big clean-ups. Following the Fourth of July weekend more than 500 cubic yards of trash gets removed -- that's about 2,000 bags. Here, garbage is piled high in a Dumpster at Jones Beach, with the beach's iconic water tower standing in the background. (Credit: Garden State Fireworks / Chris Santore)A Garden State Fireworks show includes choreography and design of fireworks as well as the creation of a soundtrack (that gets approval from Jones Beach). This software allows the main handler to select and fire off a firework as preferred. 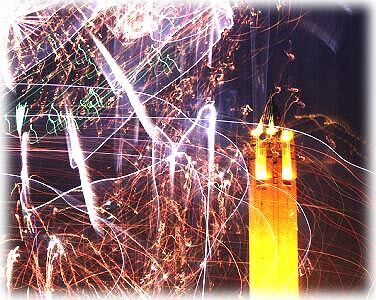 However, such arrangement also involves knowing how each firework ignites, launches and explodes. "Our goal is to bring the audience on a roller coaster of visuals and sounds," explains Chris Santore, production manager and choreographer for Garden State Fireworks. "We are just as anxious to see the display as the audience. We spend hundreds of man hours and can't wait to unleash our efforts on the sky. There are no dress rehearsals. Each display is like a snowflake. An exploding snowflake. We envision what it will look like, but we don't get to see it until everyone else does, and when it's over, chances are we will be the ones screaming the loudest and jumping the highest." (Credit: Chris Santore / Garden State Fireworks)Garden State Fireworks employees are trained directly by the senior most family members, who were born and raised in this business. "Training involves learning first and foremost to respect the danger of fireworks," said Chris Santore. "As a manufacturing company we understand every component of how an aerial display shell is built, how it functions and therefore how safest to handle it. The majority of our lead technicians are employees who work full time manufacturing fireworks. We train new field technicians annually through seminars and by working with them one to one, side by side on an actual display making sure they understand every phase of the production from set up to execution." (Credit: Ian J. Stark)With thousands of people expected to attend, the staff of operations, revenue, maintenance and safety staffers will number in excess of 700. Here, an employee of Jones Beach State Park inspects the sand during a low-crowd moment. 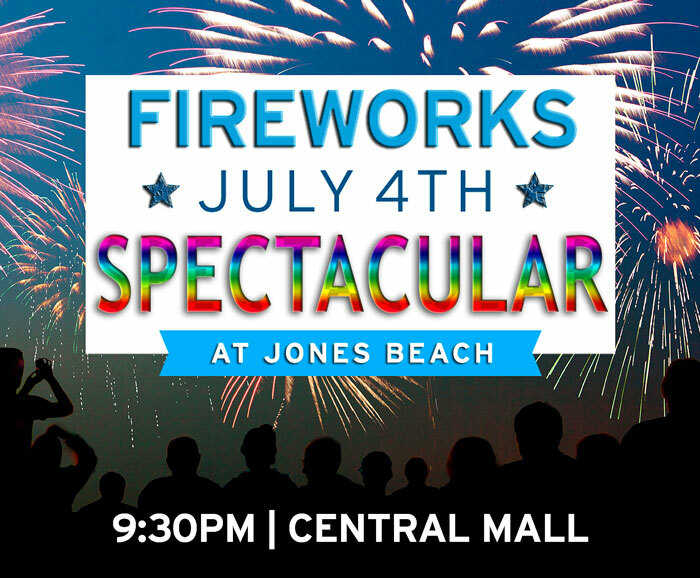 Governor Andrew M. Cuomo today announced the return of the July 4th Fireworks Spectacular to Jones Beach, bringing back the Long Island patriotic tradition last held in the park in 2009. The show, sponsored by Astoria Bank, is a 30-minute dazzling display that will feature a variety of colors and sights illuminating the sky at the highly visited and favored park. “For generations, Long Islanders, their fellow New Yorkers, and visitors alike have enjoyed the July 4th fireworks spectacle at Jones Beach, and our administration is proud to revive this tradition,” Governor Cuomo said. “As we celebrate Independence Day this year, I encourage New Yorkers and tourists alike to join us and see all that Jones Beach and Long Island has to offer." The colorful display, performed by Garden State Fireworks, will take place on Saturday, July 4 beginning at 9:30 p.m. This year, WALK 97.5 FM and K-98.3 FM will simulcast music during the fireworks presentation. The fireworks are included in the regular price of park admission. The Astoria Bank July 4th Fireworks Spectacular has traditionally drawn an average of more than 100,000 spectators in prior years. Its return is part of Governor Cuomo’s NY Parks 2020plan, a multi-year commitment to leverage a broad range of private and public funding to invest approximately $900 million in State Parks from 2011 to 2020. The 2015-16 State Budget includes $110 million toward this initiative. "We are honored and proud to be sponsoring the Astoria Bank July 4th Fireworks Spectacular at Jones Beach this summer,” said Astoria Bank CEO & President Monte Redman. "The fireworks show is a meaningful part of our communities' Independence Day celebration. Visitors come from throughout our region to enjoy the event, which has an immensely positive impact on area businesses and creates a great deal of excitement for Long Islanders and their families." This year’s program, with lead sponsorship by Astoria Bank, is also made possible with support from the Natural Heritage Trust, Foundation for Long Island State Parks Inc., Captree Boatman’s Association, Newsday, Connoisseur Media Long Island and J & B Restaurant Partners. Through NY Parks 2020,Governor Cuomo is modernizing the New York State park system – restoring facilities, enhancing visitor experience, updating signage, creating better access for tourists at parks across the State, and making comprehensive investments in the State’s most popular parks to ensure they remain relevant throughout the 21st Century. The revitalization plan for Jones Beach includes expanding the park’s recreational opportunities, restoring historic and aesthetic grandeur, strengthening storm resiliency, and streamlining park entry, all of which will improve economic development and increase visitation to the park. As part of these revitalization efforts, Governor Cuomo announced in November 2014 the return of another program that had been missing from the park for years – the Jones Beach Holiday Lights Spectacular. The 2.5-mile drive offered 250,000 visitors the opportunity to view more than 150 animated and synchronized light displays that created a colorful and marvelous holiday experience in the park for the first time since 2007.